You are here: Home / consume / comic books / The Pull List, Jan. 31, 2018: Dark Ark, Detective Comics, Moon Knight, Reactor, The Realm, and more! 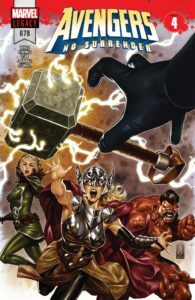 “Avengers: No Surrender” presses on into its fourth chapter, where the stakes remain high and the game is made literal. The warring Lethal Legion and Black Order competing for actual physical point tokens while the Avengers serve as their hapless cannon fodder. These battle scenes look amazing (Pepe Larraz with David Curiel is an incredible pairing) but they’re all incredibly fast-moving. The Lethal Legion are identified on the summary page, but undefined as characters and barely identifiable on the page. The Black Order fares better, since they’re more recent characters with distinct designs. But, the fights are all just one- and two-panels of people slamming into each other. There’s no scale to the fighting. It’s a little messy, but it’s big dumb fun, and I try to give comics credit for doing that. We’re still in the first quarter of this mega event with a lot of material to go. It’s probably going to read like an amazing action movie when it’s collected, and this will just be a minor first act skirmish. A somewhat hurried and surprisingly non-bloody conclusion to an action-packed arc, but when the speechifying is as rooted in character history as it is here (and looks as good as it does here) it’s a lot more satisfying. This comic is brilliant. It starts with a shock, adds another, and has even more of the hyper-kinetic parkour action of the first issue. The artwork is bold and all its own – there’s nothing I can think of to compare it to. It feels like something that evolved as much from comics as from vivid graffiti beneath a busy overpass. A brilliant, inventive work that happens to be out just on the heels of the world becoming aware of the Suicide Forest via the moronic carryings on of a young YouTube star. 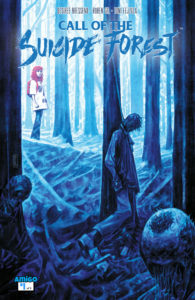 This book follows a young woman, Portia, who wants to commited death by suicide in the infamous Japanese forest. She fails in her attempt, but carries back with her visions of horrific monsters who haunted the woods. She is found by Ryoko, a woman with a strange connection to visions of the other side who recently experienced a traumatic loss. There are many interesting layers here. The stories of Portia and Ryoko are intertwined before they meet, so it sounds like Ryoko is narrating her own death rather than Portia’s unconnected plight. Ryoko is quite to call the ailing Portia out on her eager appropriation of the culture without truly appreciating it. Yet, when they both glimpse the haunting visions of the other side in Ryoko’s apartment, Ryoko sees only ghosts of people while Portia glimpses mythic Japanese monsters. It’s chilling, fascinating, and beautiful, with artwork reminiscent of Andrea Sorrentino. Highly recommended. 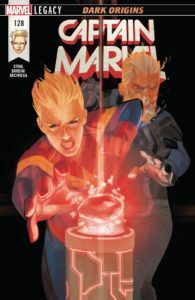 Michele Bandini continues to blow me away on art on this alternate universe arc* that explains how Carol lays her hands on an Infinity Stone ahead of Gerry Duggan’s big Infinity Countdown story in a few months. * Standard Disclaimer: I hate 99% of all stories with alternate dimension doubles. I suppose it makes sense for the Reality Stone to have embedded itself in another reality (maybe even one it created? ), but this arc wastes so much time making up goofy alternate versions of characters and having them argue with each other that there’s really not much room for anything else. The issue barely even has Carol in it. When it does she has the Reality Stone in her hands but thinks it’s no big deal and does nothing with it. I can’t even say that Margaret Stohl has the tone wrong for her made-up mirror-universe Guardians of the Galaxy, because they aren’t the Guardians we know. Maybe the tone is perfect! For me, their interactions are just one jerky, unfunny conversation after another. Then there is a tense standoff with Thanos that isn’t tense at all. Sadly, I’m just counting down the issues until this arc is over despite the book getting off to such a promising start. I would have loved this same plot if it had been set in actual reality with the Starjammers, another space-faring team with whom Carol has a long history. 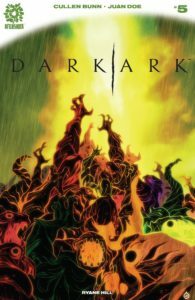 This issue resolves the first act of Dark Ark, and it’s a doozy even if it’s lighter and action and plot development than the prior few issues (which, truth be told, were almost overly-hectic). Our sorcerer and ark captain finds himself face-to-face with the heavenly host. That not only puts him on the defensive (being a pawn of evil and all), but also causes unrest throughout the down below of the ark filled with monsters. It also means saying goodbye to a pair of characters who have livened up this book so far. I’d even go so far as to say they were acting as our perspective characters in this mix of beasts and villains. In their farewell, we discover that there are elements of this plot that aren’t entirely what they seem. Joan Doe’s artwork continues to be strong here. Now that we’ve been through conflict with the various creatures even their brief remarks feel more specific and their characters more identifiable. It makes the nuance of Doe’s work stand out even more. He’s really turned into a superstar between this and World Reader – the kind of artist I’ll check out a totally random book to see. Honestly, that’s how I discovered Dark Ark! I’m looking forward to the beginning of Volume 2 in a few months! At first I thought it was because I’m not a faithful DC historian, but when I ask experts what the “must read” background is for this story, the list a lot of comics I’ve read. Then, I thought maybe I just wasn’t reading enough of the tie-ins to make sense of this. So I read some tie-ins. It’s still barely hanging together for me. 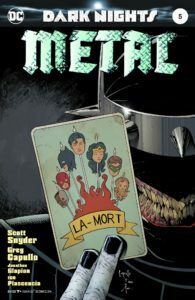 Really, it’s that this madcap event series is just as convoluted as its punctuated title, even after we’ve completely lost sight of the titular “metal” that began as the central plot of this comic. I’ll grant that this issue is marginally more coherent than the last one and slightly more equipped with plot than the one before that. Of all the plot threads, only the Green Lantern reunion with Martian Manhunter really sings here – the Aquaman and Deathstrike plot is particularly tin-eared, while Wonder Woman’s plot feels leaden. Also, the artwork continues to grate for me. I feel like Greg Capullo looks rushed here compared to strong work on books like Reborn, but my real problem maybe down to it being too bright even in its darkest moments. Yet, even if the plot is beginning to come together, this lumbering, tattered mess of an event is just too ridiculously overinflated to reach any kind of meaningful and satisfying conclusion. This series continues to do so many things right! It’s about a world where a mega-corporation is feeding off of people who plug in daily to an immersive VR action soap opera about the Greek Gods. They think the Gods are actors or computer generated, but really they’re being harvested live out of the networked dreams of clones who live their lives entirely in tanks! That’s, like, 50 Shades of Matrix, right there. I don’t think Ron Marz ever turns in a boring comic issue, and this one (with fellow Stormwatch alum Tom Raney) is no exception. There’s less world-building in this one than in the past few issues, so it feels a bit slighter in content. Yet, we’re tuned in to this world and invested in the journey, both in the real world and in the mythological story. What will happen when gods go to war? And what will happen if they are unplugged? Do they have powers in the real world? I think we’re about to find out. 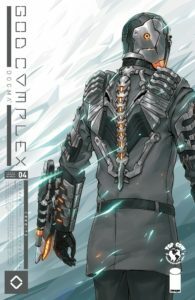 God Complex follows a single investigator as he becomes both a tool and a plaything of godlike Rulers, who each bear the name and embody the traits of a mythic diety. This issue a much faster and more abstract read than prior issues, which have been heavy on police work. This is Paul Jenkins’ way of doing things – to expand and contract, squeezing in revelations in one issue only to linger on a moment in the next. It doesn’t always work for me in his superhero material, but in this series it does. 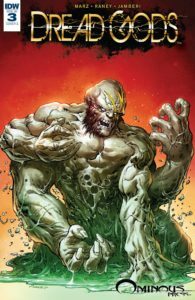 This issue takes place mostly in a dream state, where gods handle the data of a Seneca even as his physical body is stitched together after being rocked by the ending of the prior issue. They reassemble him into something less human but more than he was before, and it’s hard to know how that will affect his character or his internal voices – or their search for the hand behind the recent string of murders. This is an interesting mystery, and its uneven pace isn’t necessarily a bad thing – especially when no matter the pace of the plot we’re getting such stunning artwork from penciler Hendry Prasetya and colorist Sunny Gho. 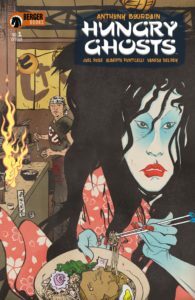 As a smash launch book for Karen Berger’s new Berger Books imprint at Dark Horse, this is a peculiar choice – an anthology series written by a chef about violent, sometimes cannibalistic ghost tales told in a proud samurai tradition. There is some present day plot to act as connective tissue between the ghost stories. A team of chefs who just finished cooking a charity dinner trading these tales with their super-rich and not-super-moral diners. I hope that present day intrigue escalates, as the 5-6pg ghost stories (drawn from real legends) here were a little ooky-spooky, but nothing particularly memorable save for some bawdy, bloody art from Vanesa Del Rey. Pointless wankery that not only erases the mic drop ending of the prior issue, but makes this entire series as waste of time. Nothing about Jean’s character fundamentally changes, and every story along the way was due to events invented by issue #1 which were resolved in #10 and then made redundant here in #11. 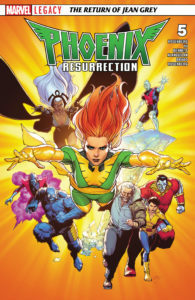 Phoenix Resurrection barely referenced anything from this series, and this series barely tied in to Phoenix Resurrection. It would have been way cooler to see adult Jean’s return merged into the plot of this series rather than playing it separately. 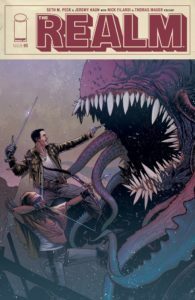 Some Vault Comics start with a first issue so completely formed that it’s hard to understand how they will grow and adapt from there, and this one neatly surmounts that problem by having its second issue be… totally a different comic book. Seriously – I had to re-check the cover multiple times to make sure I was reading the same series as issue #1! This is set in the far-flung future with only a tenuous connection to the events of the prior issue. We follow a number of intrepid adventurers who are on a pilgrimage to a single place of power called The Mass, watching as they are picked off one by one. The artwork from Vittorio Astone was brilliant, but just about everything else about this issue was a mild turn-off. The repetitive theme of seeing disposable characters felled on their way to paradise quickly wore thing. And, there were some very questionable non-speech lettering choices (a radio broadcast lettered in cursive) that really emphasized the uneven quality of the script’s future speech. 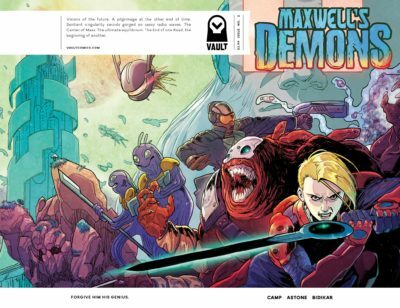 This could have easily been the first issue of a totally different series with a minor nod to the continuity of Maxwell’s Demons. I love a mystery, but this is just disjointed! This creative team is going to have to turn out a mind-bendingly great third issue to contextualize where this one came from – perhaps one that intercuts between Maxwell’s present day and this future to better show how they connect. I think it’s an interesting dynamic that Marvel Event books tend to be watered down stories aimed at a wide audience that make dedicated fans complain, whereas DC Event books are utterly unparseable unless are you an informed inside. Maybe that has to do with Marvel using events for marketing while DC uses them as story payoff? This could be a huge payoff to whatever has been happening in Doom Patrol and Justice League America, but if it was I couldn’t make heads or tails of it. 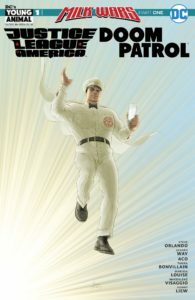 By the end I sort of got the point, but between the Doom Patrol characters and the altered JLA characters and the Milk World characters I was just totally lost until the final few pages, at which point I was just annoyed. I think DC’s avoidance of using character introducing captions really hurts them on books like these, where you have to be a studied expert to know who all the characters are. ACO’s art is gorgeous, but I need a comic with a little bit of there there. There just no denying Max Bemis and Jacen Burrows are utterly destroying on this series. It makes all other Moon Knight comics made in the past decade forgettable. It’s quickly becoming my “OMG READ THIS FIRST” title in any digital stack of Marvel Comics for its combination of viciousness and humor. However, I’m not sure how I can talk about this without giving away the massive, mind-blowing twist thatBemis introduced last issue. Hmm, how to safely dance around it? 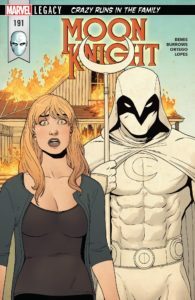 Let say this: Despite his newly unified psyche, what if Moon Knight isn’t always entirely aware of what each of his personalities are up to in their own time? And, what if a certain one of them is using that to let him believe he’s left a certain aspect of his history behind when he’s really done no such thing? I think a lot of writers (a-hem, Lemire) would dally forever in the mental health ramifications of such a development. Bemis isn’t interested in being that kind of Moon Knight author. He twists up the narrative and than watches it spin uncontrollably as it wrings itself out. Jacen Burrows pencils are marvelous here – clean, as inked by Guillermo Ortego and colored by Mat Lopes, but still with an occasional grubby, queasy quality. It’s like Jamie McKelvie crossed with Frank Quietly, and I love it. This issue also follows up on the villainous side plots from the past few issues, and they’re a great combination of foreboding horror mixed in with a little dose of Superior Foes of Spider-Man bumbling. Some people might not like the slightly comedic take on an over-the-hill version of Bushwhacker, but given how often he’s the sole enduring foe in Moon Knight’s rogues gallery I can buy that he’s got a bit of a martyr complex at this point from all the beatdowns he’s received. 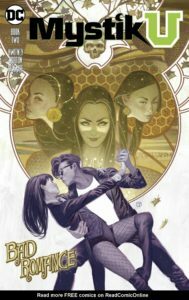 This series recasts Zatanna plus some of DC’s B-list magic users into a boarding school situation that is plainly derivative of Harry Potter. It’s a bold move to recapture some of their hit Gotham Academy magic, but despite being consummately well-made it has been weirdly flat for me. The series relies heavily on our recognition of existing DC tropes to excite us (as with the under-explained tranformations of June Moon) rather than giving us a fair introduction to these characters as though they ought to stand on their own. This issue continues Harry’s… oops, I mean Zatanna’s wondering why she’s at the academy as she fails at magic. That leads her to fall pray to an addiction plot as she tries to join a sorority on campus, which makes the target audience of the series trend a bit older than it originally seemed. If tepid YA magic academy stories are your sort of thing, you’ll enjoy this. Even if you just tolerate it, the artwork from Mike Norton and Jordie Bellaire is gorgeous – some of the best of any DC book being released right now. We’re back to the hunt for the regenerative chemical, but this issue feels like a redux of the prior one. 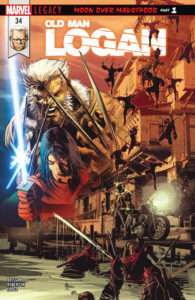 Despite the scene shift from Japan to Madripoor and a new mission for Logan and Red Samurai, almost all the same players are on the scene and we get nearly an identical confrontation as the one we saw in the last issue. Ibraim Roberson’s art is incredible here, but it’s a jarring change from the more textured work by Deodato. Maybe it’s just the too-clean colors from Carlos Lopez? However, if we’re not comparing, it looks great! What’s a little less than great is Ed Brisson’s script. We get the Red Samurai waking from her Hand control like it’s nothing. She basically just says, “You’re not the Logan I used to know.” There’s nothing else – no emotion, none of her reconciling being suddenly alive again. Points for not being decompressed, I suppose, but it feels like Brisson gave himself a terrific set-up only to be rushed through a lot of repetitive plot beats. Logan and Red Samurai were supposed to destroy a shipment, but here it’s already destroyed and there are just a few samples. I’m not sure we needed a scenery change to Madripoor to get to that. We had four issues of build up for what could have simply been a one-shot of Jean talking to the Phoenix. There’s no reveal. There’s no battle, no final trick up Rosenberg’s sleeve. There no resolve for Jean and her bubble world and the visions. There’s no tight integration to what has been happening in the teen Jean Grey series. We go from the Phoenix keeping Jean captive to the Phoenix offering her all the power in the world. And she merely sends it away, which the Teen Jean had been trying to do for the past year already. It’s pretty, and it includes some really solid pages of Jean rejecting the Phoenix, but it’s nothing this series promised to be. And sending Logan in at the end of last issue just to do what he does in the opening panels here? This series was a marketing effort that was just running out the clock to fill in five issues, and it shows. First of all: What a cover. Damn. Before I talk about the specifics of this comic, I first have to emphasize how much the art team of Dylan Burnett and Dee Cunniffee have leveled up since the first mini-series in this story, Interceptor. 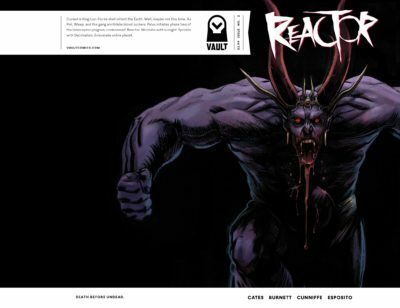 Everything in the first two issues of Reactor is bolder and more emphasized without taking away from the burned out quality of the Earth. That’s readily apparent in the opening sequence of the vampire king recalling his long history on Earth. It’s just as visually stunning as the cover. Everything goes pear-shaped in this issue after the Cliff Notes reintroduction of the universe in Issue #1. We see the massive force of Pallus ships descend on the Earth, and Poli realizes immediately they aren’t tasked with the rescue mission she initially requested. I love what Cates is doing in this comic, mashing up horror, sci-fi, and post-apocalypse and then repeatedly changing what we think is the status quo. 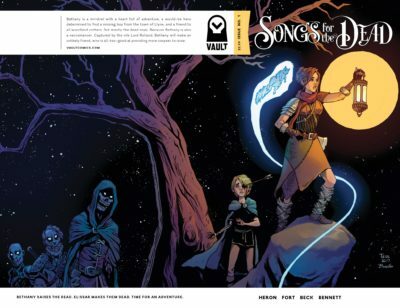 A fantasy adventure that would make a pretty decent webcomic, but feels like a stretch to release as a new #1 from the typically high-quality Vault Comics. It feels like a concept developed elsewhere and relabeled for Vault rather than something with their typical level of editorial craft. We follow a Necromancer turned minstrel out to prove she isn’t evil as she picks up quests from the local adventurer’s noticeboard, but stumbles into a plot that’s a bit over head head. The art has some moments of flatness and perspective problems, and the plot hits a few ludicrous points – like the Necromancer being okay with killing every person in the fort just to briefly reanimate them as zombies when we’ve already seen that being a Necromancer doesn’t maker her immoral. While not a bad comic, this definitely has me questioning my “buy everything” policy with Vault. Perhaps the story will hook in an interesting direction with the second issue that will make this one seem a bit more solid in hindsight. This is the second of DC’s newly launched New Age of Heroes, a line devoted to highlighting some fringe concepts as opposed to Rebirth’s line-up of greatest hits. Its also the second New Age of Heroes book in a row to feel a lot like a rejected 90s Image Comics pitch than a cutting edge new series. Maybe that’s owing to the vintage of the talent on these titles, for whom Image really was cutting edge at some point? 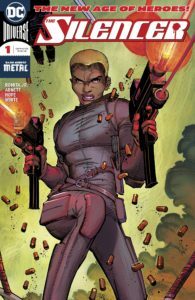 To be entirely fair, this story has a few fun beats in it, and Silencer’s powers are awesome.However, the rhythm of the story is jerky and the art is not helping it feel more smooth and coherent. John Romita Jr. makes some totally bizarre choices here – like close-up panels that cut off the corner of an eye. Also, this is the worst coloring I’ve ever seen from Dean White, my favorite colorist. Between JRJR’s weird dark slashes of pencil shading as inked by Sandra Hope and a set of garish 90s-inspired colors, this book is ugly. 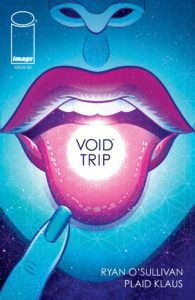 This comic about a pair of burnouts in their space Winnebago is a ludricrous blend of Hitchhikers Guide to the Galaxy and Fear and Loathing in Las Vegas with a dash of Spaceballs thrown into the mix (because, duh, space Winnebago). Yet, what seemed like a willful tendency to follow the main character’s acid flashback approach to life in the prior two issues here just feels like a disorganized narrative. It’s very middle chapter. It feels like we’ve lost the plot a bit. In one scene, a group of warring robots are the blue team and in the next they’re the red? I re-read it repeatedly to try to find the joke, but I’m just about it as confused as our captured protagonists. Also, what did we learn about them in the prison scene, only for them to quickly escape? Adding to that, there’s too little commentary from the ominous, philosophical hunter robot here compared to the last two issues. That all said, I continue to the love the artwork from Plaid Klaus on this title, and not just the character designs in the foreground. There is an optical illusion in this issue that I stared at for a solid minute. 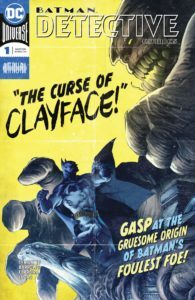 The Pull List: Batman, Damage, Dark Fang, Ales Kot, & more!